Another day, another poor XJ destroyed for entertainment. Such is the tragedy of being such a cheap, stout, high volume automobile. This time, XJ death came at the hands of some Hoonigans who inverted the steering, and struggled to wrap their minds around the “left is right, right is left” controls. Seriously, this looks terrifying. With this setup, if the driver turns the steering wheel clockwise, the end of the pitman arm shown above moves in an arc that’s mostly leftwards in the image above, putting the drag link into compression, pushing the Jeep’s right knuckle (the one on the left in the image above), and forcing it to rotate about its ball joints. The tie rod, which is attached to the drag link on one end and to the other knuckle on the other, then gets put into tension, pulling the knuckle on the right side of the image above, rotating it about its ball joints. The result is that the Jeep steers to the right. 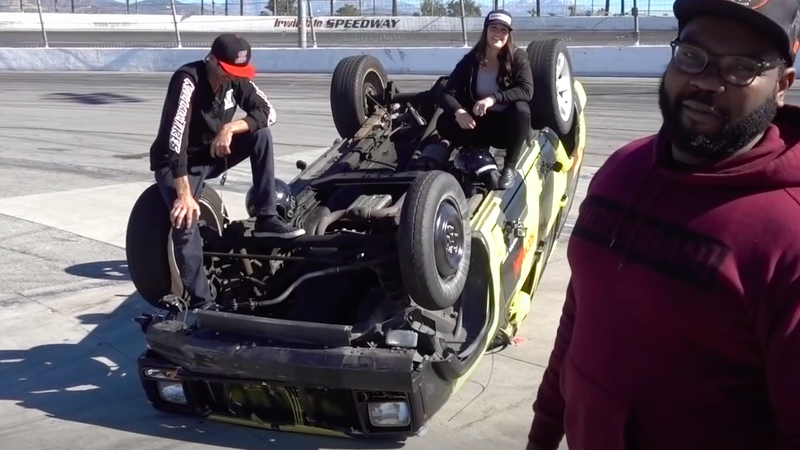 What the Hoonigans did in their experiment above is simply flip the pitman arm 180 degrees so that it’s facing forwards. Thus, when the driver turns the steering wheel clockwise, the end of the pitman arm actually moves in an arc that’s largely towards the right in the image above, which puts the drag link in tension, and the tie rod in compression, turning the wheels left—the opposite direction as before. It’s totally silly, but it’s also lots of fun to watch TheHoonigans try to figure out steering controls that are completely opposite what their many years of driving experience has taught them. That the XJ, a rather flip-prone vehicle in the first place, ends up on its roof is no real surprise.